Caprese Salad with Pesto Dressing… last blast of summer! Ginger Peanut Sauce for stir fry and such…. Aunt Louise’s Amazing Caramel Corn! To me, nothing says Easter like a roasted leg of lamb, spring vegetables, baby new potatoes, and a delicious Lemon Coconut Cake. A perfect spring dinner! Oh, and Grandma’s Rolls of course, no holiday is complete without them. 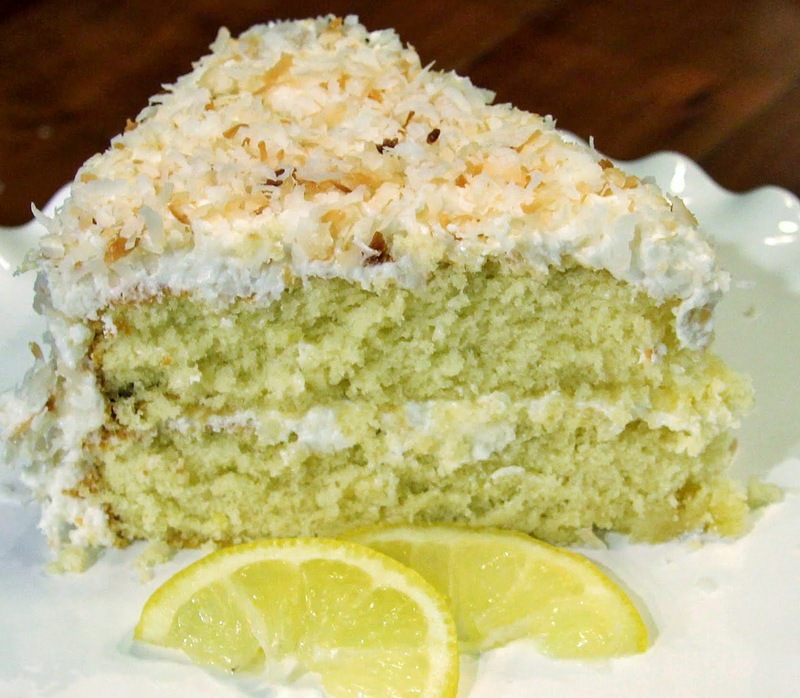 If a lemony coconut cake is on your menu for Easter this year I think you will be happy with this recipe. I was actually planning to make a lemon filling for it but then I tasted how lemony the cake turned out and decided I didn’t need it. That simplified things quite a bit. If you are married to the idea of a lemon filling, by all means, go for it but I would strongly recommend purchasing a good, jarred lemon curd (I won’t tell, I promise). You have enough to do already! 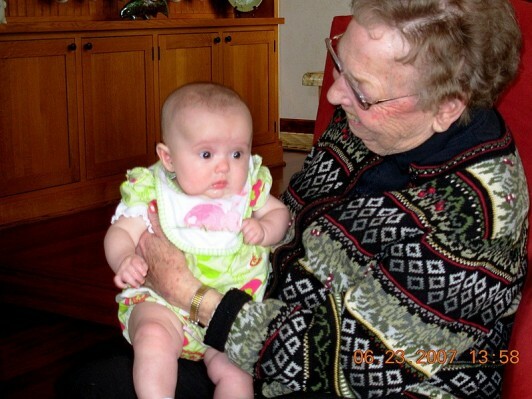 This is my Auntie Louise with Ella on her first Easter. We were so fortunate to be able to spend Ella and Hailey’s first two Easters with her. Even though they don’t remember, I know her love made an imprint on their hearts forever. She is my inspiration for this cake. It’s not exactly like the one she loved (I just came up with the recipe last weekend) but I think she would approve. 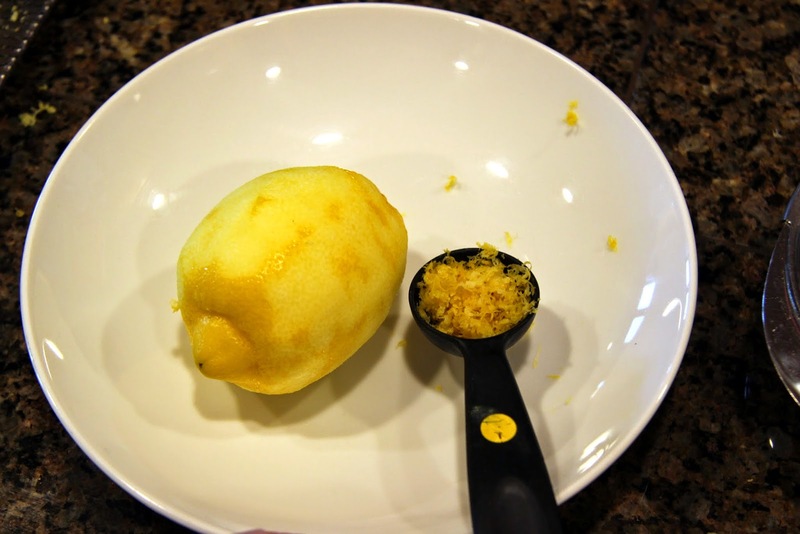 Zest and juice one medium lemon. It should yield approximately 3/4 TB zest and 1/4 cup juice. 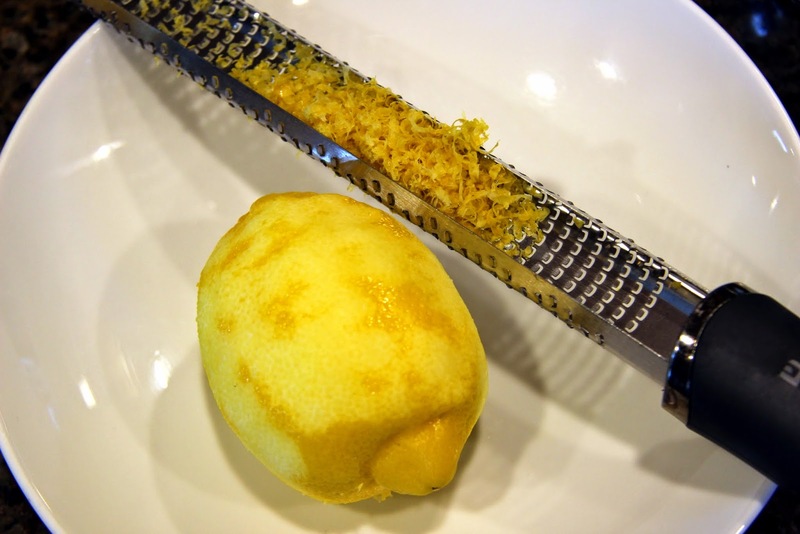 Always zest first with a Microplane or similar zester, then cut in half and juice. 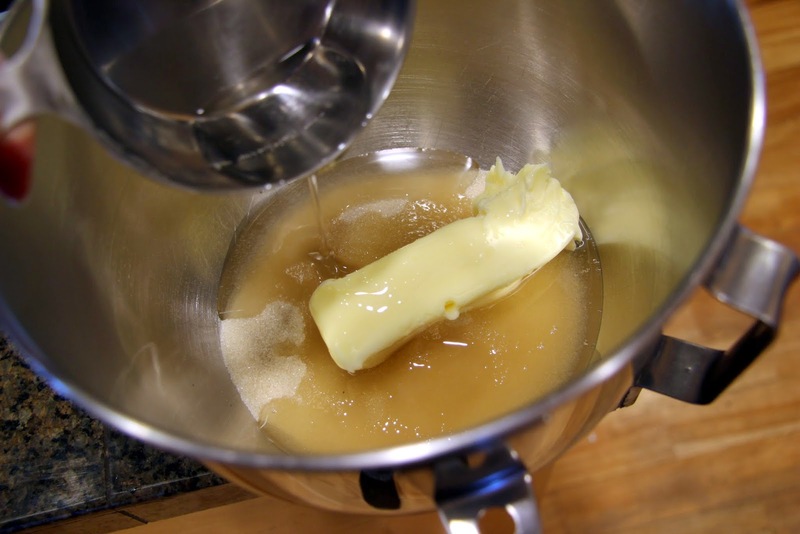 Add the zest and juice to the cup of milk and set aside while you start the batter. 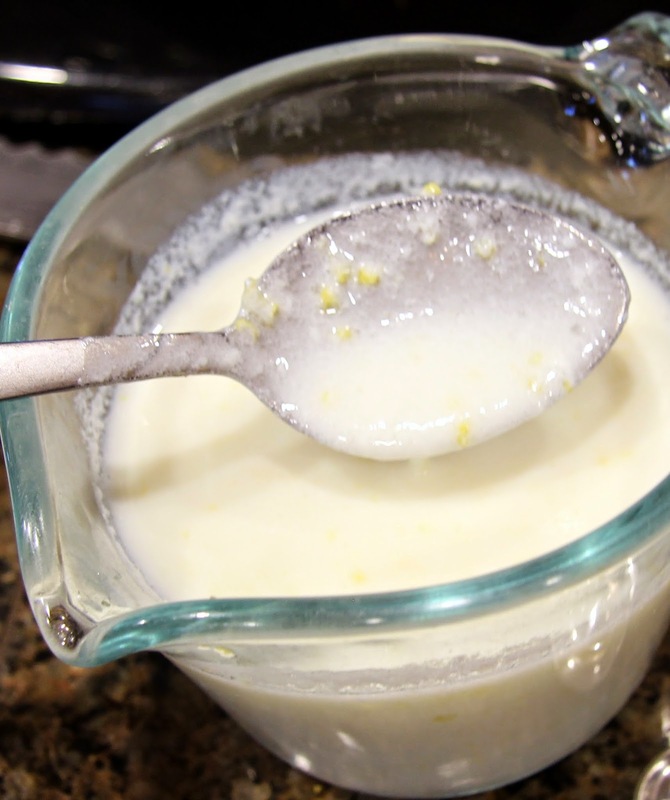 The lemon will curdle the milk so it is the consistency of buttermilk, nice and thick. 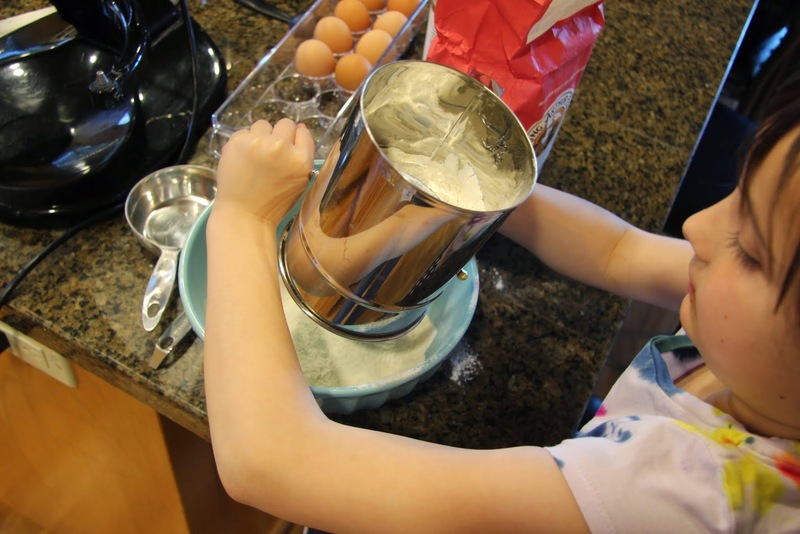 In a large mixing bowl, sift together the flour, baking powder, and sea salt. Set aside. 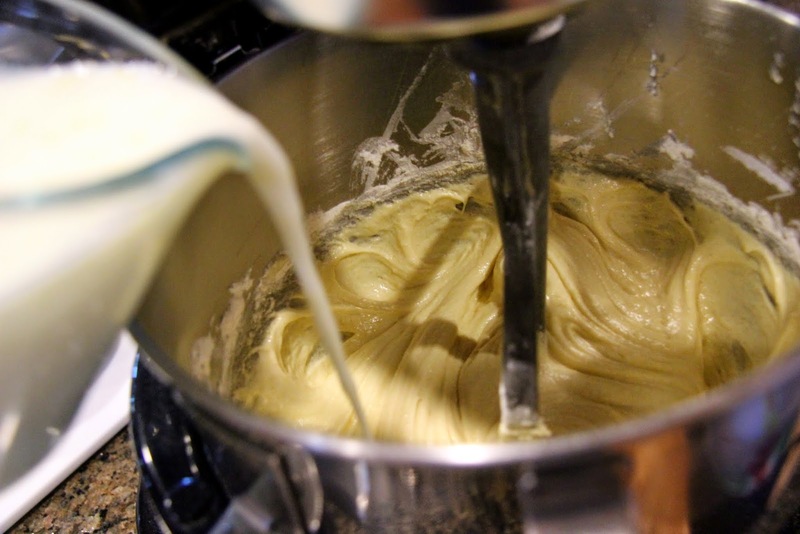 Note: If you are using a stand mixer for your batter, go ahead and start the butter, oil, and sugar first (next step) and do your sifting while it’s doing the mixing. 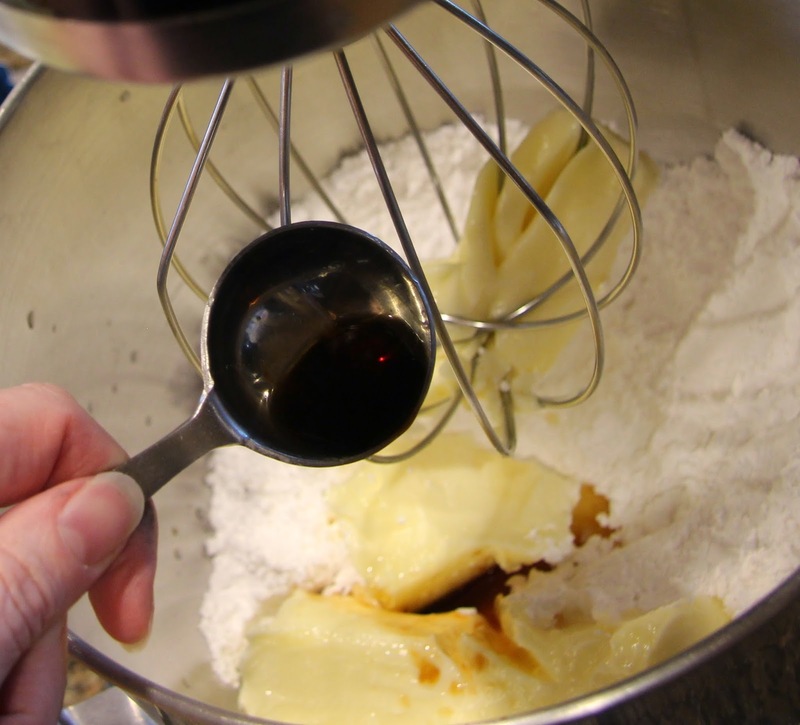 If you are using a hand mixer, do the sifting first and set aside so it’s ready to go since your hands will be busy throughout the mixing. 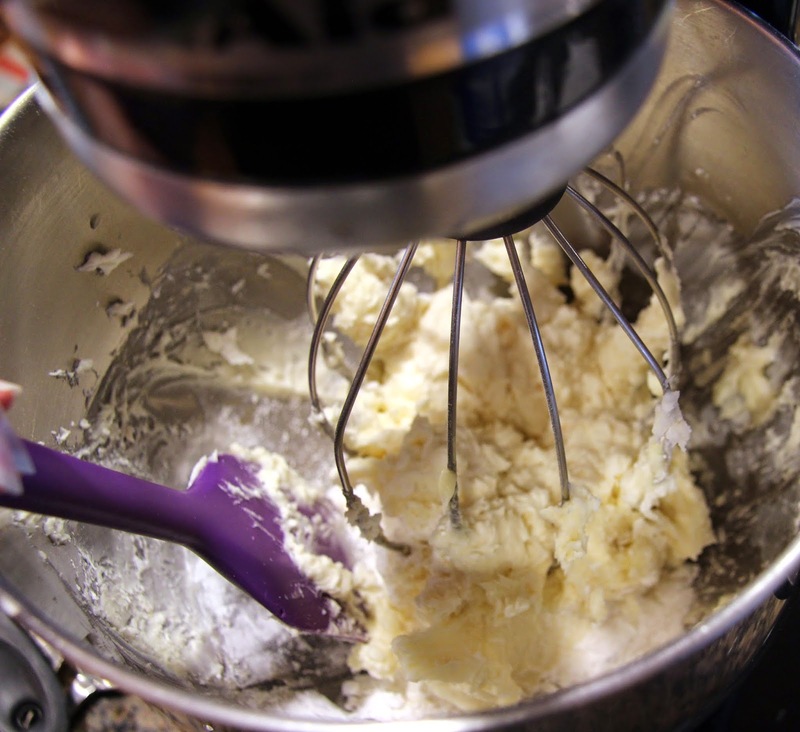 Using a stand mixer with paddle attachment or an electric hand mixer, cream together the sugar, butter, and oil on medium-high speed until light and fluffy. 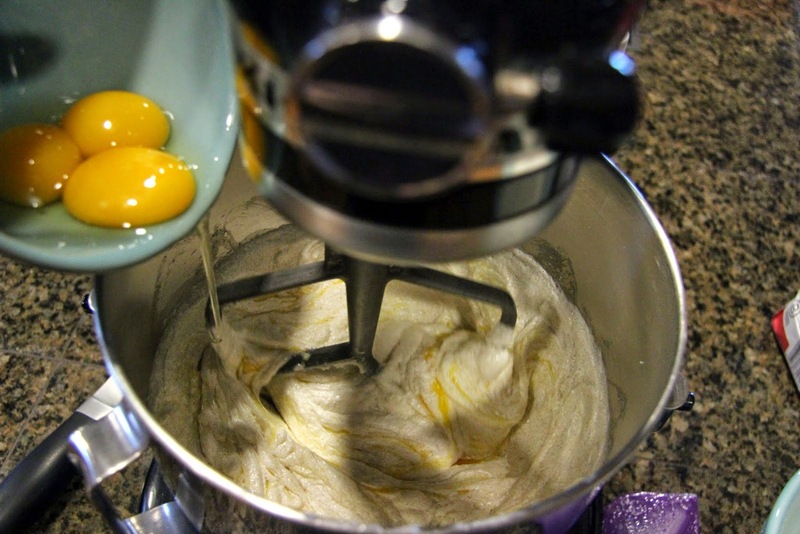 Crack eggs and extra yolks into a separate bowl before adding to the batter. 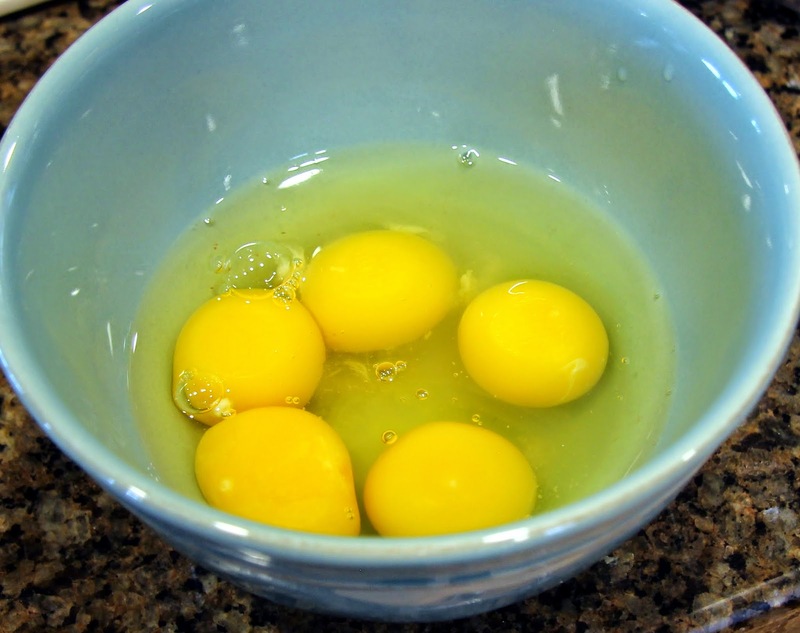 Add eggs/yolks, one at a time, beating well on medium-high speed after each addition. 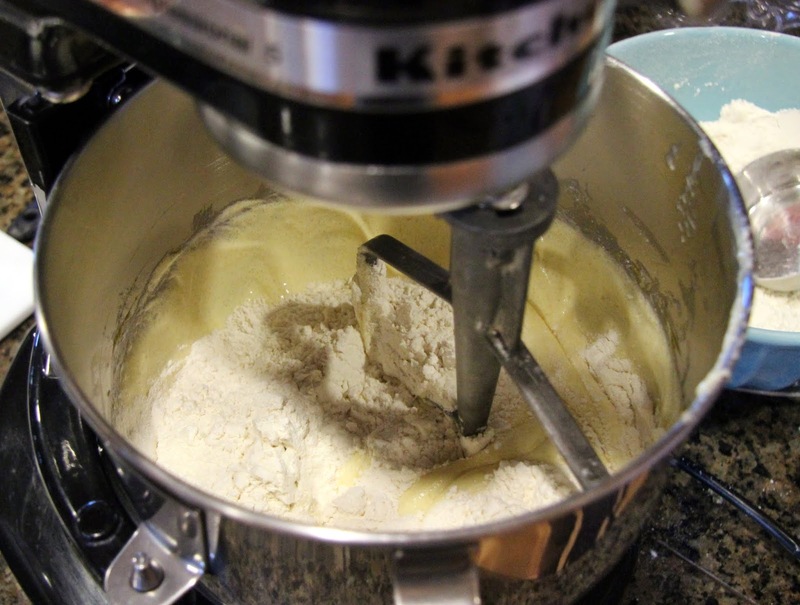 Mix in one-third of the flour mixture and beat on low speed until fully combined (but no more than that, you don’t want to over-mix once you start adding the flour). 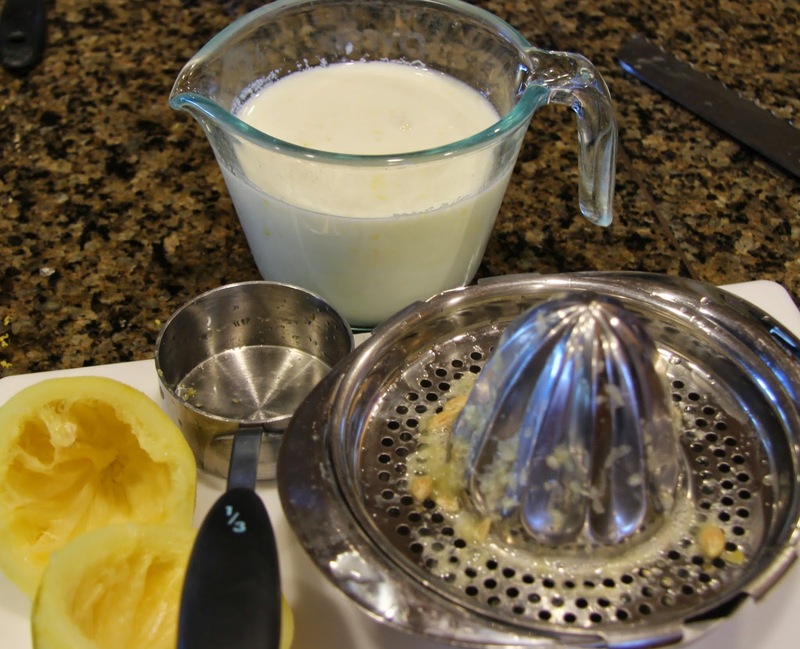 Add one half of the lemon/milk mixture and beat on low speed until combined. Repeat with another third of the flour mixture, followed by remaining half of the milk mixture and ending with remaining third of the flour mixture. 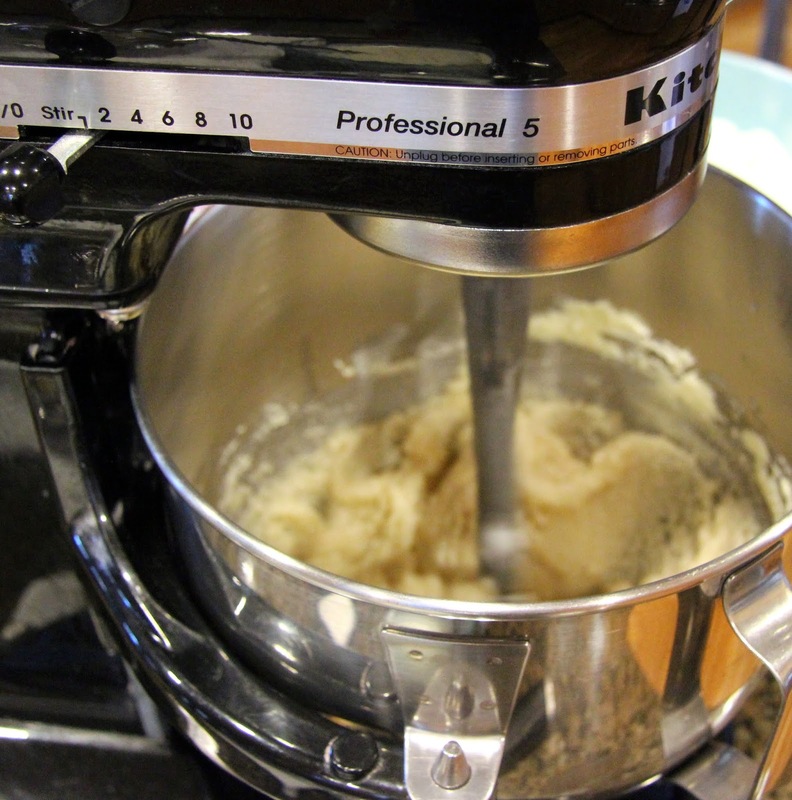 Mix on medium speed until all ingredients are fully combined. 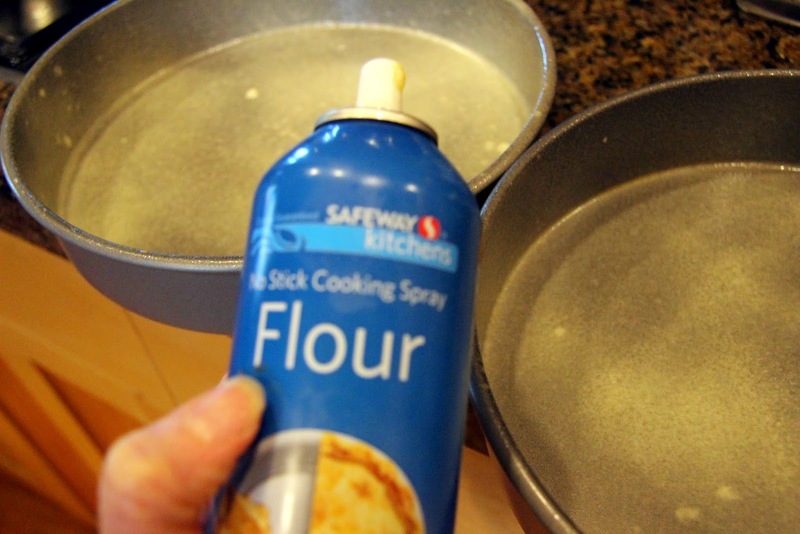 Prepare two 9 inch cake pans by spraying liberally with non-stick spray, then coating them with a thin layer of flour OR buy a handy baking spray that contains flour (like I did) and you can skip the layer of flour. 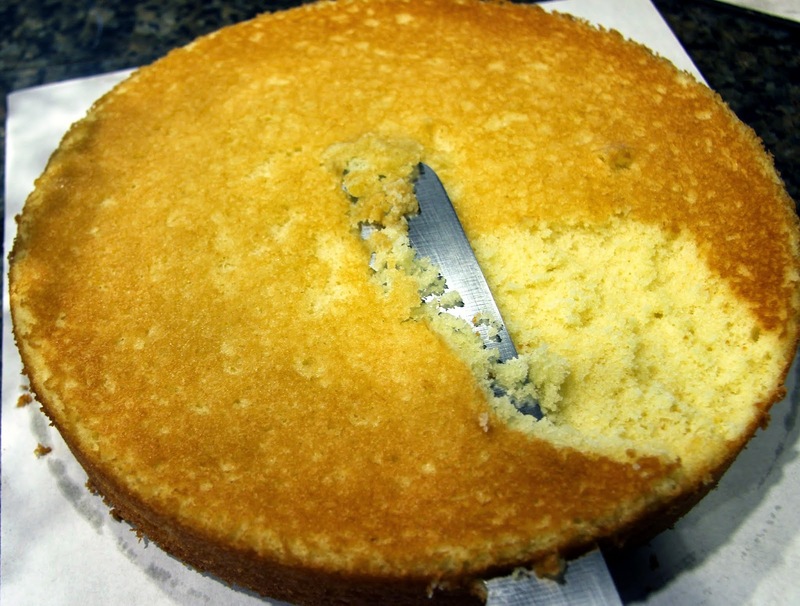 It’s crucial to properly prepare the pans because there is nothing sadder than a beautiful, delicious layer of cake sticking to the pan and breaking into pieces when you try to take it out. 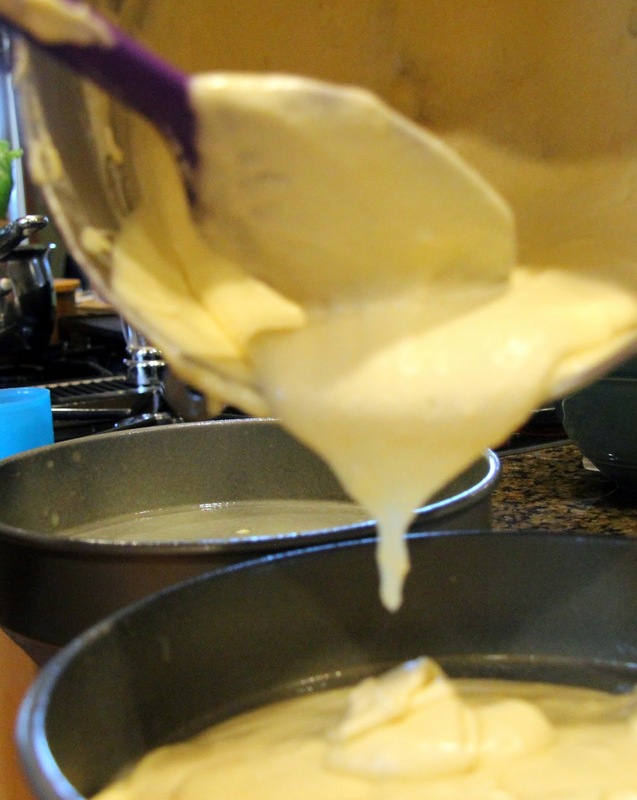 Pour cake batter into pans, dividing evenly between the two. Bake in preheated 350-degree F oven for approximately 20 – 25 minutes until the top is golden and springs back when pressed with a finger. 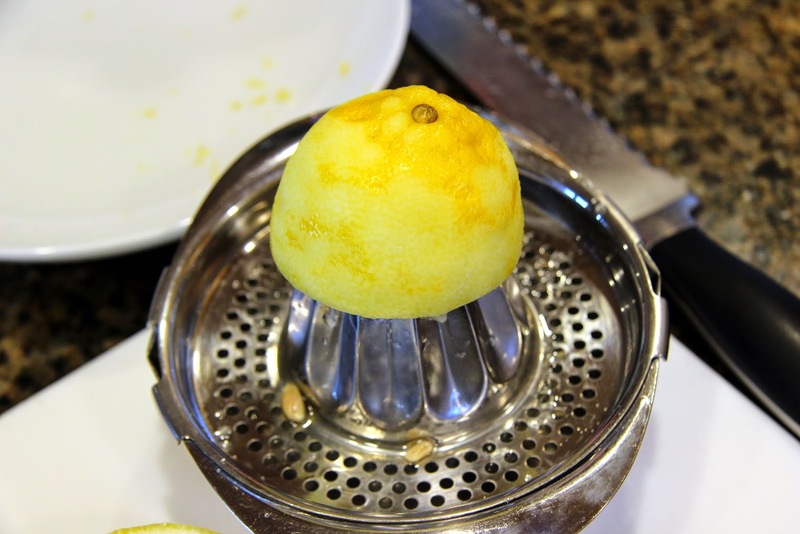 If in doubt, insert a sharp knife in the center; if it comes out clean it’s done. 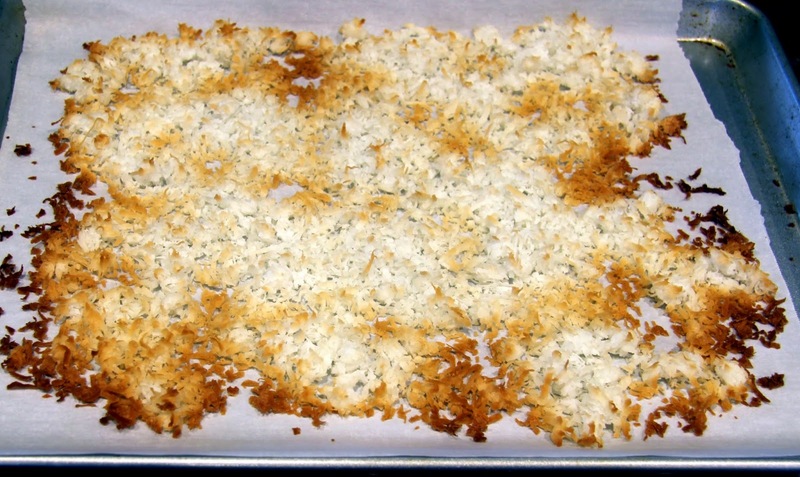 Note: Leave the oven on to toast the coconut (instructions below) after the cake is done. Allow the cakes to cool in their pans before turning each layer out onto a flat surface (I had these handy cardboard squares but you can turn the first layer directly on to the cake plate you plan to serve on). 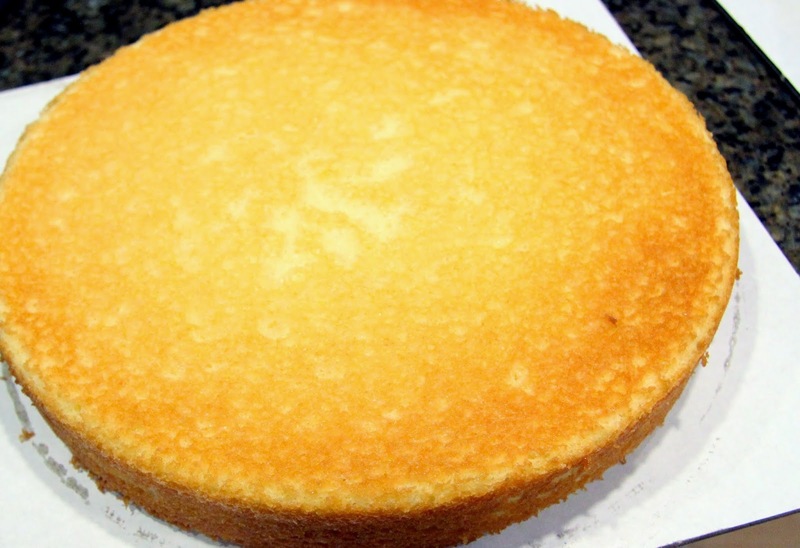 Note: If you are nervous about handling the cake layers, you can refrigerate them in the pans until they are firm and that will make it a lot easier to take them out in one piece. 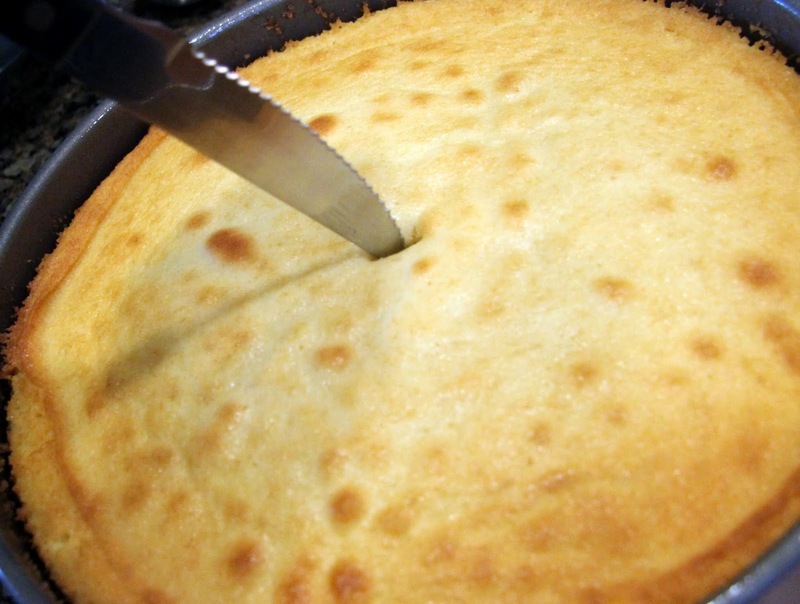 Also, place whatever plate/surface you are using upside down on top of the cake pan then flip them together so that the pan ends up upside down on top and you can simply lift it off the cake. For the second layer, I do this with a cardboard square/round or a flat plate then set it aside. I then can carefully slide it onto the frosted first layer. I hope that helps! Meanwhile, toast the coconut. 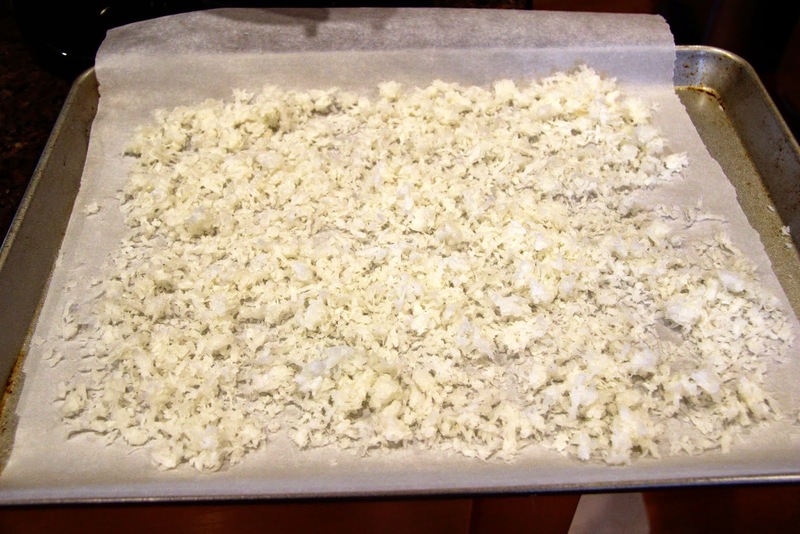 Using a rimmed baking sheet lined with parchment paper, evenly spread out two cups of shredded, sweetened coconut. 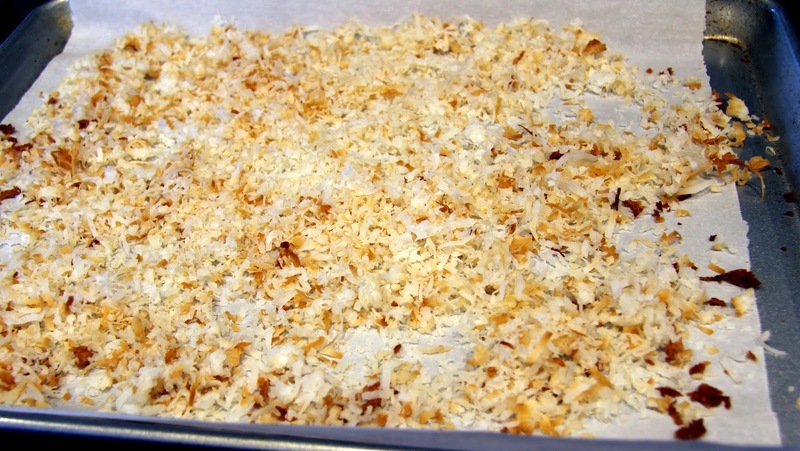 Bake in preheated 350-degree F oven for 8 – 10 minutes watching closely so the coconut does not burn. The edges will be darker than the middle which is fine because you will mix it all together and it will be a lovely variation of color (see below). Set aside to cool completely. 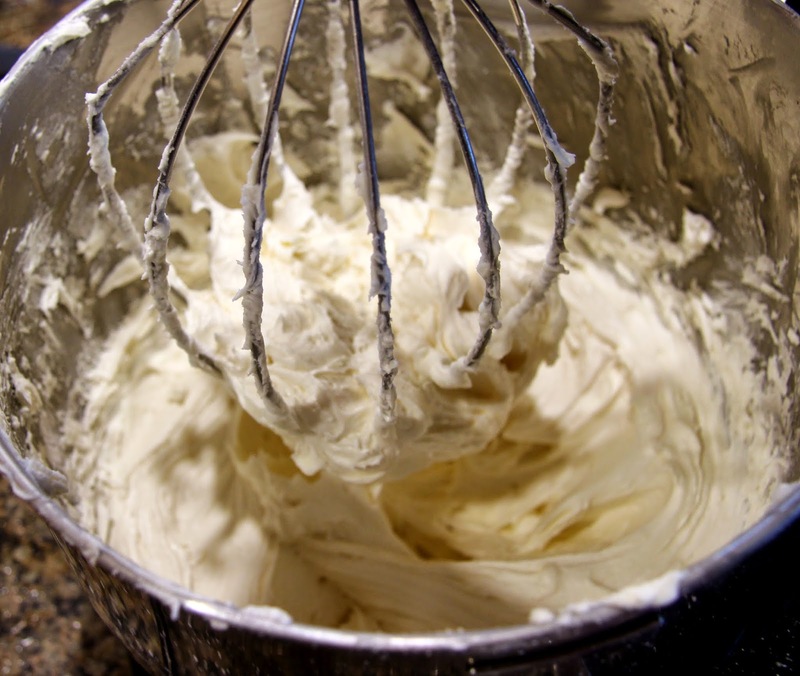 Once the cakes and coconut are completely cool, begin making the frosting. 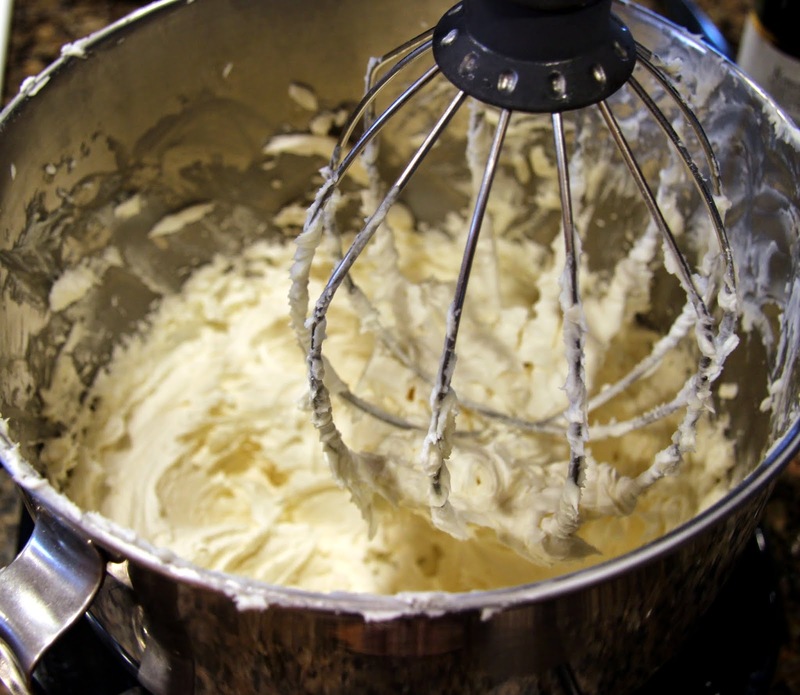 Using a stand mixer with the wire attachment or an electric hand mixer, beat together half the powdered sugar (2 1/2 cups), 1 cup softened butter, 1 tablespoon lemon juice and 1 tablespoon vanilla extract until well combined, scraping sides often with rubber spatula. Start with low speed and move up to high as ingredients are combined (unless you want a powdered sugar shower). 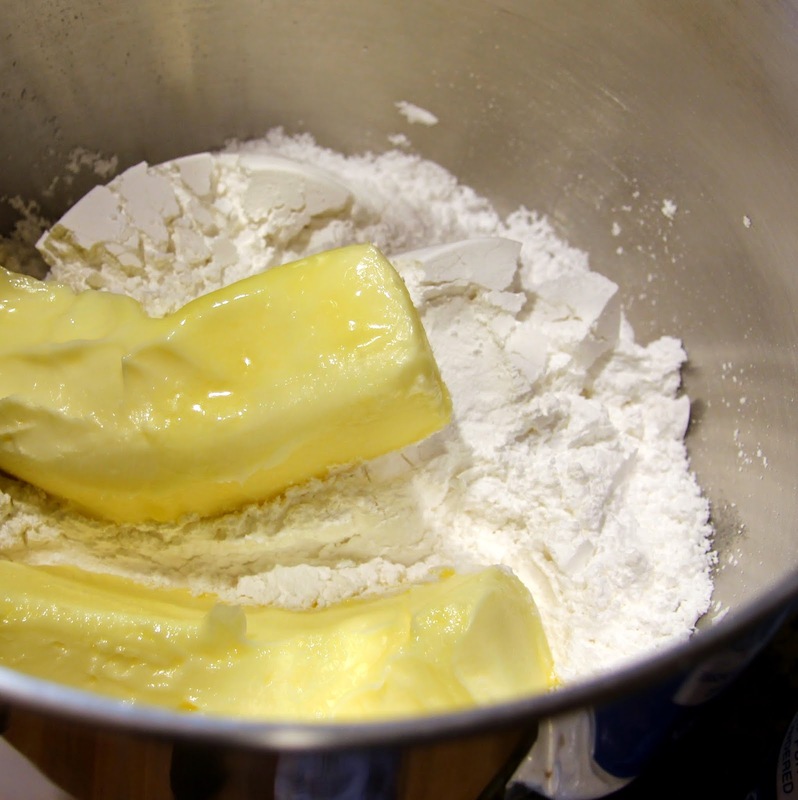 Mix in half of the remaining powdered sugar (1 1/4 cup), beat well, then mix in milk, beat well and add the rest of the powdered sugar (1 1/4 cup). Again, start on low speed and work up to high. 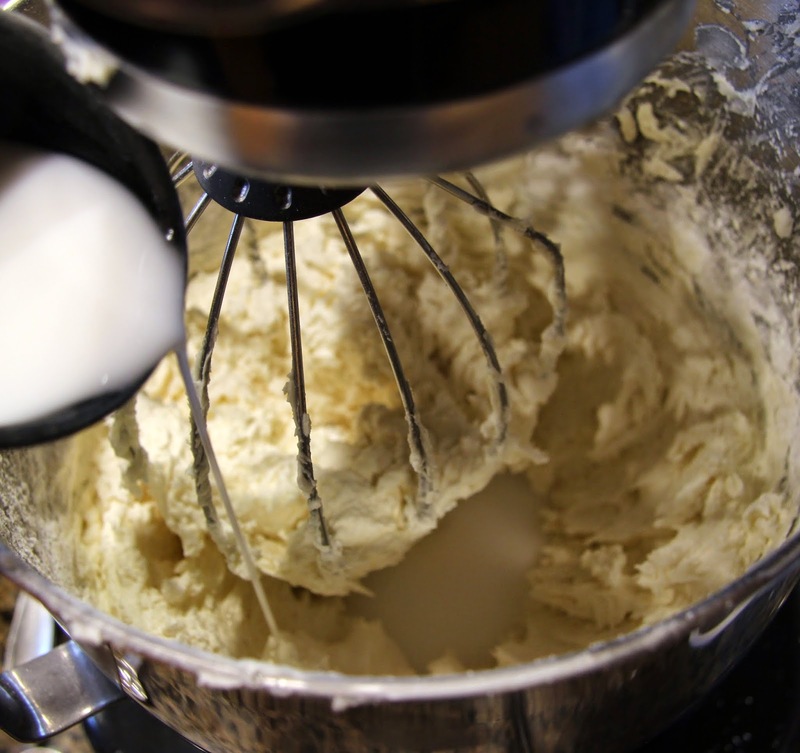 Continue beating the frosting on high for another five minutes or so until you achieve a really fluffy, spreadable consistency. 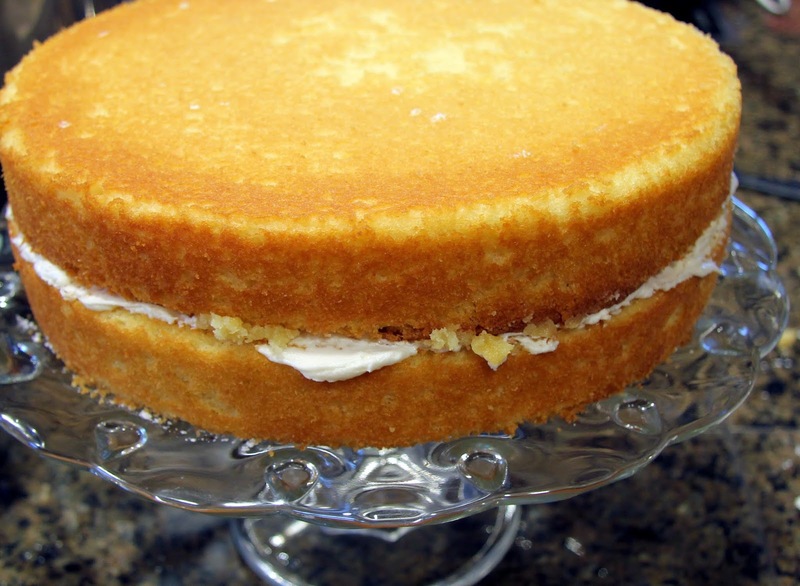 Before you begin frosting your cake, don’t be afraid to trim each layer a bit if they appear lopsided. The bonus is you get to have a little bite of cake! 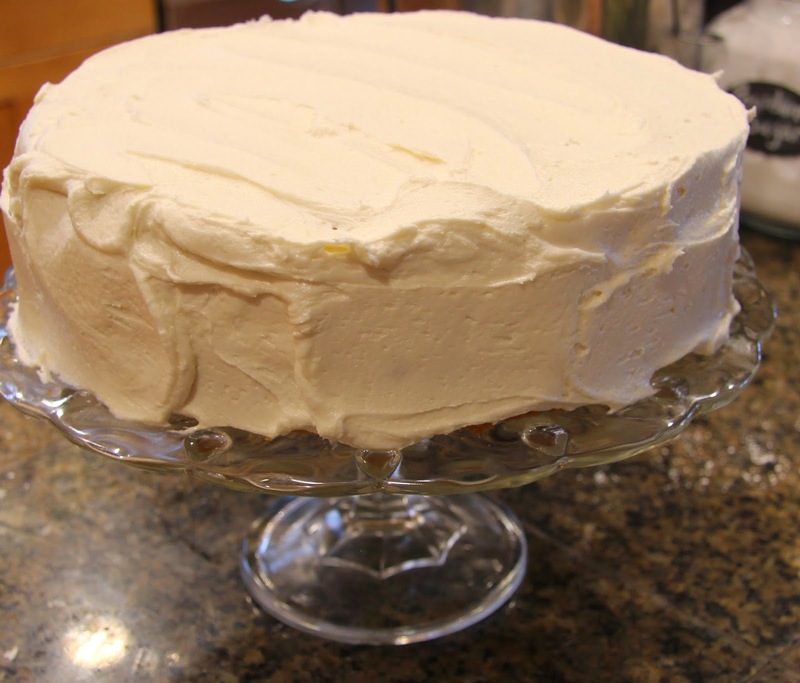 Place a good size dollop of frosting on the first cake layer, spread evenly, then top with the second layer. 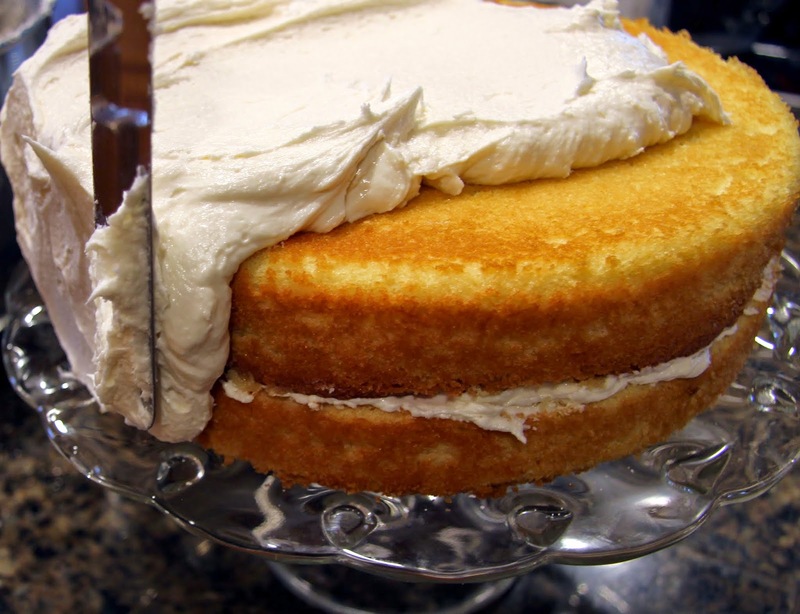 Place most of the remaining frosting on top of the cake. 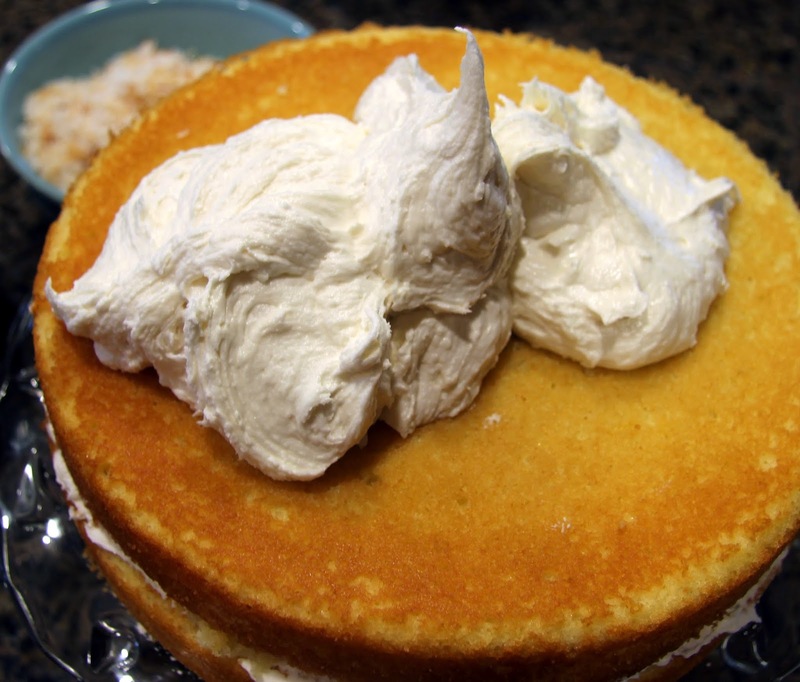 Using an offset spatula, spread the frosting from the top down to the sides in a thick layer, adding more frosting as needed until the entire cake is covered. 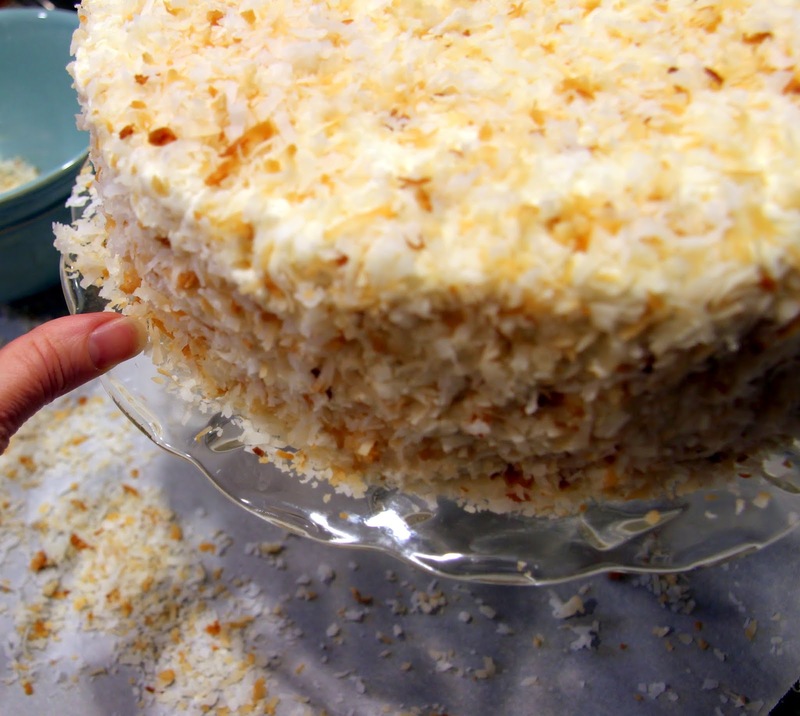 You want to be sure and have a thick enough layer so the toasted coconut will stick nicely. Don’t worry too much if crumbs show because the coconut will cover them. 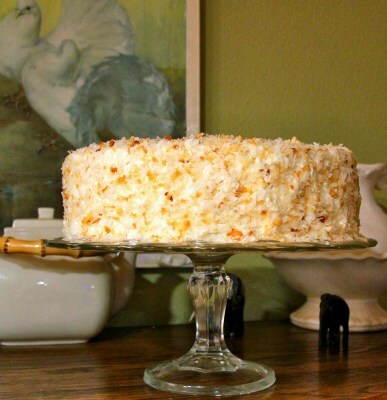 Finally, cover the entire cake with the coconut, pressing lightly to stick it in place. 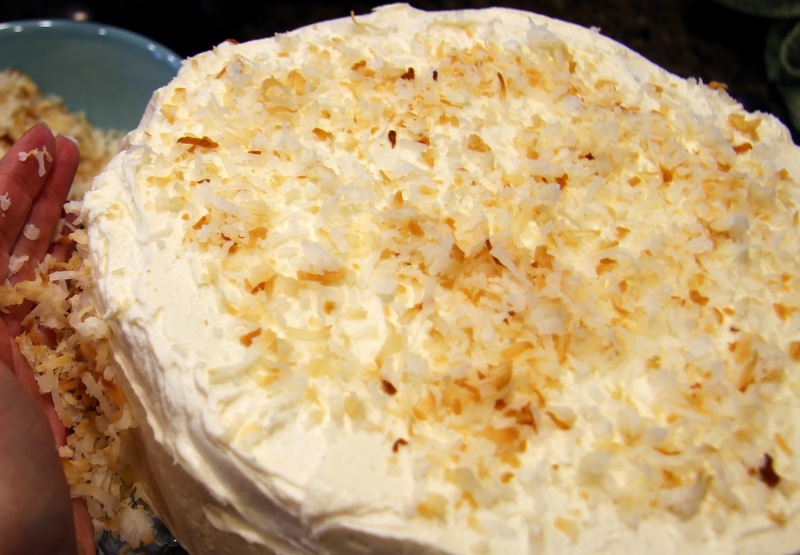 Note: To do the sides, place some parchment paper underneath the cake plate to gather excess, then just take generous handfuls of coconut and press into the sides of the cake, allowing the excess to fall (you can pick it up and use it as needed). That’s it! You did it! It should be simply beautiful as is or you could adorn it with little nests of jelly beans if you so choose. Whatever your definition of God/Source… Happy Easter! Hello, I'm Molly, aka Auntie. I live in beautiful Bend, OR with my husband, twin girls, and our dog, Davy. I love to share cherished family recipes and develop recipes of my own, focusing on wholesome, healthy ingredients. I started this blog with the intention to teach my nieces and others to prepare meals on their own and demystify the process a bit. I hope to encourage and inspire home cooking because I truly believe it’s essential to our health and well-being. Sign up to have the latest recipes and cooking instructions delivered to your mailbox!